What Happens When You Meet Yoda? Home » What Happens When You Meet Yoda? Sometimes you meet a person who has a “name” and you’re super disappointed that they’re not what you’ve expected (not that your expectations are fair) or you’re all bummed that they weren’t quite how they portray themselves online. I am sure more than one person has felt that way about me in the past and I get that. It’s hard to know exactly who a person is from a few blog posts or instagram photos; you build a person up to be someone that they’re not. Michael always tells a story about how horrible it was to meet one of his childhood heroes, Ken Griffey, Jr., when he was a kid. Apparently he was a real jerk and it cut Michael deep. Working with people online for 12 years, I’ve had my share of crushing disappointment. 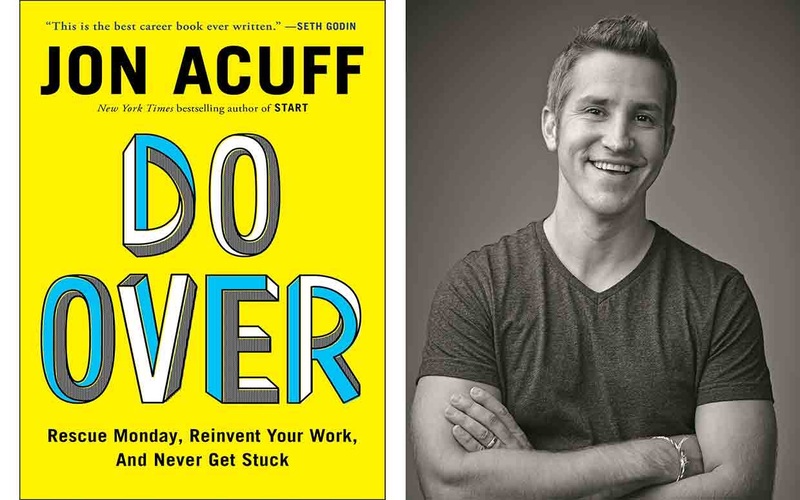 I wanted Jon Acuff to be the dude I had built up in my head as I read his books. I wanted him to be hilarious and smart and full of Yoda-like wisdom that comes with somehow having conversations with hundreds of brilliant people around the country. I was willing to pay pretty much anything he asked me to for the people that I work with to experience what I did when reading not one but three of his books. So we booked him for an event we put on in Utah called Hustle Under the Stars and they LOVED him. He stood outside for hours signing books and taking pictures with us Lemon Droppers. You guys, he’s so much better than just a HilariousBusinessYodaGuy. He also cares about people. He’s a doer. He is willing to be vulnerable when he needs to be to teach a lesson. He spent his valuable time with us when we asked him to. He answered the questions we peppered at him at dinner one night. I’m baffled by his “someone told me once…” stories. I have so much to learn. Just 2 meetings with him and I know I have so much to learn. Basically, he let 2 strangers connect to him and where he’s going and what’s on his heart. Jon Acuff does not disappoint. So all of that leads me to this: Michael and I are in this place right now where we are really reaching out to connect with our higher purpose. We have been able to give away more this month than we have in all the years we have been married combined. It feels really good and for the first time I think we can actually change lives on a massive scale. Since we lived in Reno, Michael especially has been moved to do work with women who find themselves addicts, involved in prostitution and human trafficking. When Jon mentioned an organization he is working with that connects to that same purpose, we knew it could be a great way for us to get involved. This week, Michael flew out to Nashville to be a part of Jon’s campaign to give back to Thistle Farms. Michael decided to take one of our daughters, Teagan, with him to experience a service project for the first time (sidetone, HOW can they be old enough for this now?). They boxed and labeled 1,000 candles to help raise money and create jobs for the women of Thistle Farms. You can read more about what they do on their website but it is freaking cool what they’re doing for women in Tennessee. Jon has set a goal to sell 5,000 candles in the coming months to help buy much-needed supplies and hire more employees that need these jobs to survive. Quite literally, their lives depend on them. You can learn about his BHAG (big hairy audacious goal) HERE. Mad respect for such a big goal. Michael and I struggled with saying “yes” to this event because when it comes to something as important as helping people in need, we want to make sure it’s done for the right reason and it’s not seen as “publicity.” So, we told about 3 people what he was doing and he went to see for himself what it was all about. A few of you spotted Michael and Teagan in the photos posted on social media from the event, which is hilarious. Knowing Michael would likely meet Jon’s wife, Jenny, at the event, I sent him with instructions to talk to her. You gotta know the person behind the person. There’s always a brilliant wife behind a husband that writes honest and hilarious things. There has to be, right? As I suspected, Michael told me that the Acuff family is legit awesome. They’re sweet, real, funny, big hearted people…of course they are. Michael tells me Jenny has the best questions ever and is just as brilliant as I told him she would be. Teagan loved her. She told me she gave her brownies and Sprite – what’s not to love about that for a 6-year-old? They spent time with Michael and Teagan. They put themselves out there and used their voice to help other people even in the middle of the hustle and I can get on board with that. I can tell you from experience, putting your name on the line to raise money for people that need it is super scary and intimidating. I say “no” to almost everything people ask me to promote for this reason. The internal tape goes like this: “Am I enough to ask this of people? Do people really trust me? What if nobody shows up? What if it’s a flop? That’s on me. I would be disappointing people who need me.” It’s really hard. The Acuffs did it though and I have got a ton of respect for that. I’m proud to have had a small part of our family there to support that action because we need more of that. You want form your own opinion? 2. Read his book Do Over because hilarious and awesome. 3. Tonight at 7:30pm (central), Jon is gathering the Lemon Droppers to do a webinar for us. He’s giving selflessly of his time for FREE to help us in our businesses. Who does that? If you want to be a part of it, you’re welcome to sign up and hear what he has to say. If you work or know someone that does, I know it will apply to you. No matter what, you will at the very least be entertained. You gotta sign up. Bottom line, I’m blessed to have connected with Jon in my business and I have even more respect for his hustle now that I’ve gotten to know him even a little bit. I’ve never been more NOT disappointed in meeting someone I wanted to be awesome. Thanks Acuffs. This is EXACTLY how I feel about you!!! I look up to you and couldn’t wait to me you, but wondered if you would be “as good” in person. The first time I met you was at the airport in Salt Lake City for convention 2015…you were tired from traveling, I’m sure, but you were so friendly, took time to introduce me to your family and gave me a big hug! It meant so much to me since I was a new Lemon Dropper and had come to convention alone! At every event after that, I have brought a few business people and told them, “I can’t wait for you to meet Lindsay…you will love her!” I have been right every time…EVERY person that I have brought along has LOVED you. You are caring and real with our team. You are always leading by example. You are always giving freely to us. You are like my own Jon Acuff! I am so blessed by you and the Lemon Droppers! AMEN to that, Emily!!! I wholeheartedly agree! I have friends who work in the communications industry and it always surprises me the people who ARE legit…and the ones who disappoint. This is part of why I don’t usually put people on a pedestal – I can admire them without being disappointed in them that way. I am touched at the heart you and your husband have for giving back. I grew up in Reno and there is so much good to be done there. I admire you so much and one day, soon, I hope to meet you and hug your neck. You have inspired something in me that has been dormant way too long. Thanks for being authentic.